Timbmet carry one of the most extensive product ranges in Europe from certified hardwoods, quality softwoods, engineered products and innovative designer panels. 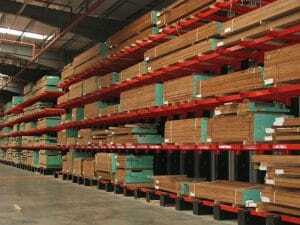 With a dedicated merchant’s team offering support to the Timber industry the opening of their state of the art Distribution Centre at Stanfield in the Vale, Oxfordshire will prove to be pivotal in helping them to serve their customers into the future. Stakapal has worked in partnership with Timbmet across their sites at Ely, Stonehouse and Basildon developing an in-depth understanding of their Storage requirements and how the day to day business operates. The Stanford in the Vale site (originally a World War 2 airfield) required extensive building work to be undertaken in order to make the site fit for Timbmet’s purposes, part of which encompassed three main storage areas. Design and specification of the dedicated Cantilever Racks varied to accommodate the multi-functional requirements of the operation, with common column heights of 5.9 metres for both internal and external Racks designed to carry loads of 6000 kgs per column side. 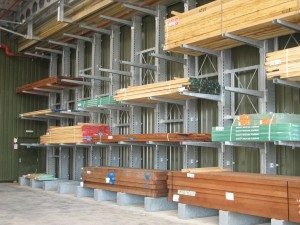 Rack profiles included Timber Racks carrying Internal Hardwood Storage & External Cantilever Racking Sheet Material Storage that also applied to an extensive amount of External Racks supplied in hot dipped Galvanised finish.